These are the words of Bassem Youssef, an accomplished heart surgeon who- in the midst of the Egyptian Arab Spring- quit his day-job to become a full-time comedian. His satirical show, Al Bernameg, quickly became the most viewed television program in the Middle East, with 30 million viewers per episode. Egypt is a country where free speech, a right many of us take for granted, is not settled in law. Bassem and his team endured threats of physical violence, protests and legal action, eventually leading to him fleeing Egypt with his family to seek political exile, and safety, in the United States. All because of a few jokes. At a time where our even our most liberal democracies are transitioning into oligarchy, where police are becoming militarised, and where the liberal values of tolerance and hope are being upended- it’s more important than ever that we have the mechanisms of satire to observe, challenge and interpret our political leadership. Q: What does democracy mean to you? [Bassem Youssef] Different people have different interpretations of democracy; and most people who come to power through ‘democratic’ means think democracy is just the tyranny of a majority, and that’s a problem. In the middle-east we see this tyrannical democracy with political and military leaders who feel they can do what they want if they have sufficient votes. I believe that democracy first and foremost is about the protection of minorities and those people in society who need help. For those who are already powerful or wealthy, democracy is meaningless. Democracy matters to those who need protection, and who may not otherwise be vindicated through democratic process. With enough votes, you can change a country’s constitution, you can put people in jail, you can start passing laws that would impact human rights. If you have a democracy that protects everyone, in all situations, that is a true democracy. Q: How do tyrants and regimes acquire power? [Bassem Youssef] People have lost their belief in the establishment, they believe that the outsider who would bring anger and chaos is much better than the status quo; even if that is against their own interests. Fear is a great weapon, and tyrants use fear against their people to encourage them to vote for increases in military spending, even when infrastructure, education and healthcare are suffering. To create fear, you need an enemy; so those in powers create one. The enemy could be the establishment, refugees or even the rest of the world. Creating an enemy gets people to back a cause, even when that cause is false. Q: What is the role of comedy in political discourse? [Bassem Youssef] Comedy chips at people in power, particularly those who use tyrannical power. It strips their fake respect, and destroys the fake fear they create; and these are people who rely on being respected, and being feared. They don’t want to be held accountable, questioned or made fun of. Comedy and satire make the emperor look naked. Tyrannical and borderline dictatorships are very funny. To be that tyrannical? To want to be a dictator? To want these things means you have separated yourself into a different world; and in my opinion, that’s very, very funny. In the United States, satirising political leaders is nothing new. We see it with Trump, but it has always been there with George W. Bush and many others. There is an old-tradition, a kind of appointed satire which pushes back against those in power. [Amber Day] I am originally from Canada, but now live in the United States; and historically the US has not really been known for satire, particularly visual satire. But there has been an enormous outpouring of really interesting, politically engaged material that has emerged- particularly after 9/11 where the press felt it was almost unpatriotic to be critical of George W Bush. That was a problem… A lot of hard questions simply weren’t being asked in the lead-up to the Iraq War and it became the satirists who took charge- pointing out the hypocrisies and inconsistencies. Around the world, our political debate has become choreographed and staged- the PR machine has got really good. You then have the rise of cable news who made the decision to hire basically political hacks as so-called pundits, who will repeat those talking points. This creates one thing; drama, you have people having arguments and screaming at each other- but there are no substantive discussions of learnings. So what’s the truth? It’s just people repeating the narratives and that does a disservice to the public, and to public conversation. Jon Stewart was one of the first in terms of the televisual satirists to really kind of lead the way in political satire, and he has made a big name of himself for a good reason. He taught people how to engage in media criticism, in some way. He would pull back the curtain a little bit and kind of say ‘why is it that this same phrase is being repeated on all of these television stations?’ and he’d put all the footage together and then it looks absurd when you see it back to back to back to back. He pointed out how those talking points were made and pointed out the way in which that political conversation is being scripted. There’s a hunger for hearing that critique. There are a lot of us, not everybody, but a lot of us want to hear that critique being made, and I think it’s coming through the strongest presently, often within the realm of satire. Q: How do political leaders respond to satire? [Amber Day] I think generally, most leaders within political democracies have, no matter what they’ve thought in private, tried very hard to feign disinterest or to even be a good sport and sort of go along with it. In democracies, we do assume that people have the right to make jokes, and so Donald Trump is clearly interesting, because he’s not afraid to show his thin skin in an odd way (a behaviour that tends to be more the response of autocratic leaders who are very worried about their own particular image). Trump’s image is so important to him because so much is riding on it, and it’s something that he (and individuals like him) put so much energy into sustaining. It’s usually more seen in autocratic regimes that you have leaders going after satirists in particular- they may end up saying it’s about them insulting religion or insulting the state and not making it personal but of course it usually is. Q: Can satire change public attitudes or indeed political outcomes? [Amber Day] it’s almost impossible to isolate the effect of any one thing and say that a particular show or a particular sketch, caused this massive shift. That is, I think, a very simplistic way of thinking about satire and thinking about how political citizenship works. People usually conceptualise satire as a one-to-one action. The single whatever this pretty good satirist is doing, and this sketch here…. Are they really going to change an election? …the answer to that is usually no, and it’s not usually how satire works. People aren’t so fickle that they’re sort of massively swayed from one opinion to another by just seeing one text, viewing or reading, satirical or otherwise; even a political speech. However, popular opinion does shift over time, and culture in general is where that shift happens. Satire is part of that culture, and I think satire can have real effects but the effects are usually seen in more shifts in the public conversation. And that may sound unimportant, but satire can bring previously peripheral issues into the mainstream public consciousness, or it can shift the frames that we use for thinking about a particular issue, or give urgency to something that has been there but it’s one of many issues but to kind of pull it out and bring it to the surface and give it some moral weight. Q: What makes great satire? [Amber Day] Satire is contextual, and it has to speak to the particular context of where society is at. There are activists doing really great satire and there’s film makes who are doing interesting satire for the purpose at hand, but satire is most effective when it pulls back and looks at something more systemic. I actually make the distinction between political humour and satire. Political humour is the stuff that goes after personalities and individual politicians and their funny ways they talk and walk and what not. That stuff is very funny sometimes, but it’s not particularly substantive… okay, that politician might be gone, eventually we’ll get rid of him and there’ll be another peacock. Good satire really gives us a fresh perspective on things from a bird’s eye view, and it’s not just about the personalities, but about the hypocrisies, the inconsistencies, the parallels that might have gone unnoticed. Pointing, revealing patterns in the way society or the political structure or political conversation is happening. And some of the weaknesses there. Q: How do you personally keep the strength to fight? [Bassem Youssef] In Egypt, I had my show- that was my job, and I held onto that for strength. When it was too difficult to me, I couldn’t continue- I’m not a freedom fighter! When there was a genuine threat to my safety, and the safety of those people around me – I stopped the fight. 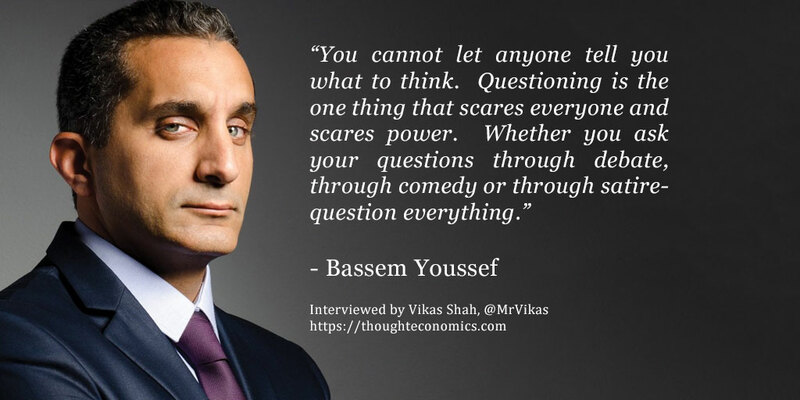 [Bassem Youssef] You have to question everything, and bring everything out in the open. You cannot let anyone tell you what to think. Questioning is the one thing that scares everyone and scares power. Whether you ask your questions through debate, through comedy or through satire- question everything. Questioning is the prequel of the revolution. Dubbed the “Jon Stewart of Egypt,” Bassem Youssef was the host of the popular television show Albernameg which was the first political satire show in the Middle East. Originally presented as five-minute videos on YouTube, Albernameg grew to become the most watched television program across the region, with 30 million viewers tuning in every week. It received wide acclaim around the world, with coverage on some of the biggest media outlets, topping off with Youssef’s appearances on The Daily Show with Jon Stewart in June 2012 and April 2013. In June 2013, Youssef hosted Jon Stewart on Albernameg in Cairo, marking the second season’s peak. Some of Youssef’s accolades include being named one of Time magazine’s most influential people of 2013, being recognised by Foreign Policy magazine as a leading global thinker of 2013, and being awarded the International Press Freedom Award by the Committee to Protect Journalists that same year. Youssef’s most recent project is Democracy Handbook, a ten-part series exploring topics of democracy on Fusion.net. Youssef was also a visiting scholar at the Center of Democracy, Development and the Rule of Law (CDDRL), Standford University, and continues to give talks around the United States. Youssef majored in cardiothoracic surgery, passed the United States Medical License Exam (USMLE), and is a member of the Royal College of Surgeons (RCS). Amber Day is the author of Satire and Dissent: Interventions in Contemporary Political debate, and the editor of DIY Utopia: Cultural Imagination and the Remaking of the Possible. She has articles in Social Research, Popular Communication, The International Journal of Communication, The Electronic Journal of Communication, Communicazione Politica, and the anthology Satire TV: Politics and Comedy in the Post Network Era. She is editing an anthology titled DIY Utopia. Her research focuses broadly on the intersections of art and political speech, including ironic and satiric communication, political performance and activism, and public debate.